What's white and fluffy all over? 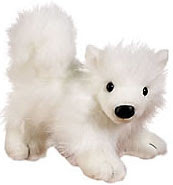 The samoyed webkinz dog. What a cutie. This pup is intelligent and very very friendly. There is no better friend to have. This pup is for you! hi! you posted at my blogroll. what do you mean that I should confirm? thanks! !